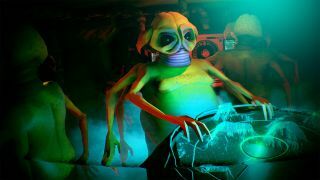 The Long Journey Home is a “space exploration RPG” that promises to blend the gameplay of old classics like Starflight and Star Control with roguelike replayability, “in a procedurally generated, endless surprising living universe inspired by beloved modern science fiction shows like Farscape and Firefly.” That's an awfully tall order, and quite a shift away from the point-and-click adventures that Daedalic is best known for. But the teaser released today, and the screens that came along with it, look very promising. The setup is not unfamiliar: Humanity takes its first, tentative step toward the stars, botches the job, and flings a ship and crew to the other side of the galaxy. And now you, as the commander, must lead your people on their long voyage home. The game promises “complex quests and moral dilemmas,” secrets buried on ancient worlds, and of course danger, danger, danger, everywhere you turn. And because it's procedurally generated, it will be different each time you play. The similarities to FTL: Faster Than Light are obvious, but it's the invocation of old-school games like Starflight, and the promise of “a space game that actually cares about character,” as writer Richard Cobbett put it on Twitter, that really lights my fire. The Long Journey Home is expected to be ready for release in the second half of 2016. Find out more at tljh.daedalic.com.